Rumours persist about the burning of the West Pier. What you’ve heard isn’t true. Hundreds of people were watching but none of them talk the incident, or the weeks leading up to it. If someone has told you what happened to the West Pier, they were wrong or lying. It wasn’t the owners of the Palace Pier that did it. Despite their public statements on the West Pier regeneration, the rival operators had more to gain from the project than they had to lose. Nor was the fire set, as some people claim, by the West Pier Trust. They certainly had a motive: renovating a grade 1 listed pier would be forbiddingly expensive. Replacing a ruin is cheaper, but that’s not enough reason to murder a landmark. No, the West Pier was torched by a small group of heroes as hundreds looked on. The weeks leading up to the fire were almost unbearable. The pier was invading minds, growing more and more powerful. Dreamers found themselves walking long circles of the deck, down one side and back up the other, shuffling, staring at their feet. Rest failed to refresh the dreamers, as if the dream-walks exhausted them, as if the pier was stealing their energy. In these dreams, it wasn’t the sea and shoreline of Brighton beyond the railings. Instead, the pier was transported to other places. Sometimes one would see stark, barren cliffs. Other times there were piles of refuse, burning, reeking noxious fumes, dreamers coughing as they promenaded. One time it wasn’t sea below the pier’s boards but a pit of bleached bones, as if the bodies of millions had been stripped to skeletons. The pier wasn’t a wreck in these visions. The buildings were new and clean – but the windows were opaque, the doors sealed. We paced past, knowing there was something inside these structures. We knew not what it was, or whether it was one thing or legion. More than once I woke sobbing, not sure if it was fear or sadness I felt. I expect other people had the same awful awakenings. Those who could sleep carried on their lives, but those who couldn’t, who dreamed of the pier, they recognised each other by their sallow eyes and dazed stares. When dreams are no refuge it drives men mad. The pier had to be stopped but we could not bring ourselves to discuss it. I tried a couple of times, only to find my mouth drying up, turning away as my tongue failed me. I don’t know who finally did it, who managed to break the pier’s spell, but I knew it was going to happen. The town was dead quiet that night, the pubs empty. The all-night shop at the bottom of my street had been open continuously for a year or two, across Christmases and New Years. They closed at dusk that day. The streets were clear but I found myself walking. I knew something was happening and I knew that it involved the pier. There were others walking towards the seafront, drifting in the same direction. 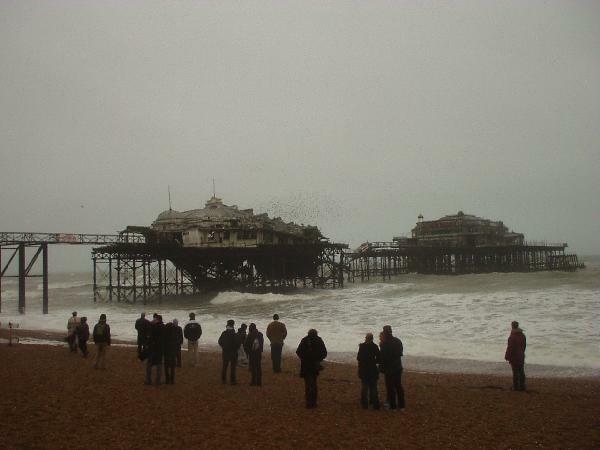 I arrived at the Palace Pier, could see the West Pier’s hulk in the distance, but didn’t dare approach it, not directly. I disappeared up Pool Valley, heading West on the back-streets, away from the shore. A friend had a penthouse in Embassy court and I knew I could watch from there. Back then, Embassy Court had yet to be renovated and the building was decayed and sickly. There were some who said it would need to be pulled down. Before I went inside, I looked up and saw people leaning over the balconies, looking east. I was not the only one to have come here. I buzzed up to my friend and climbed the steps to her apartment. The front door was left open, no-one there to greet me. I walked into the main room, which opened to the balcony. A crowd watched from there, nobody I recognised. I took my place at the railing. I did not know what would happen, only that I should be there to see it. I imagine there were people watching from across town. Sussex Heights must have been full of viewers, and I imagine there were others on the race hill. All the insomniacs waited until they saw the fire, looked as it took hold. Nobody said anything, nobody cheered. The only sound at the first sign of fire was a sigh. Now the Palace Pier stands alone. To its left was once the chain pier, now gone. To its right, the ruins of the West Pier. A ghost on either side, its neighbours both disappeared. He’s told me that a few times but never elaborates. He is resentful, hates being here, marooned in Brighton three quarters of a century after he died. This is a man who was disappointed by his first life, where he sometimes had to go without food to have enough money for stamps, a life that was too lonely. I tell him he should come out with me to bars, to parties, try to let it go, but he never does. He makes no effort to do anything with his second life. He shudders and walks away. But I continue staring at the sea. Its strength and power captivate me. The water here is too cold and cloudy to see more than a few inches down. Howard sometimes claims that something monstrous lives in the waters off Brighton. I don’t know if he’s joking when he says this, but he may well be right. That’s the thing about the sea. At least outer space is open – nothing can hide there and we are tracking every object for millions of miles. The sea is so much closer yet we have no idea what it hides. The thing sleeps. Occasionally people are drawn to this shore. Sometimes I feel its pull too, a gravity, as if Brighton is tilted, as if it inclines towards the shore. Not everyone can resist this force. August Bank Holiday 1973, the writer Ann Quin drowned herself near the pier, ‘given to the sliding of the water’. Once considered a giant of British literary fiction, her books now only rarely surface into print. I feel so sad for her, stepping into the cold water, nobody to call her back. I wonder how long I could keep going in that cold water. Once you’re a certain distance from the beach, it doesn’t matter how deep the ocean is, it might as well go down forever. Once you can no longer dangle your toes down and touch the bottom, there could be anything below you. I turn back and Lovecraft has vanished. I scan the shore and can’t see him, which means he probably went to buy a coffee at the Meeting Place Cafe. I always tell him to try the rock cake, but he declines. I’m tempted to leave him, to walk in the other direction, but I don’t. I’ll buy a coffee and we’ll walk further. Lovecraft and I, bound together, unable to escape one another. 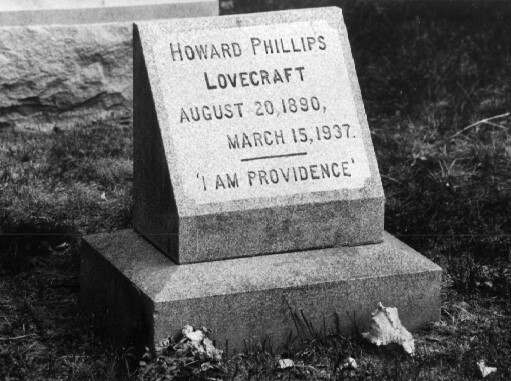 While often loathesome, Lovecraft is a fascinating character to write about. Long before I knew about his time in Sussex, I wrote another HPL story, Eat at Lovecraft’s, which features Howard Philip reincarnated to run a greasy-spoon near Hastings. There is also an audio recording from when it was performed at Liar’s League.